Nice and local for me for this press event, just up the road in Wetherby. The e-tron is the first car from Audi that is fully electric, no engine, no hybrid, just batteries and electric motors. As with all electric cars, it can all get a bit technical, talking in kWh, Kw, range, DC charging, Direct current, CCS (Combined Charging System) Heat Pump, Three Phase power and so on. But the e-tron has a 95kWh battery mounted beneath the passenger compartments and is the lifeblood of this SUV. The battery feeds two electric motors – one per axle – which jointly deliver an output of up to 300Kw. The e-tron has Asynchronous motors that can increase their output for a short period of time. This Boost performance is available for a maximum of eight-seconds. During this time, the output of the front motor increases from 125 to 135 Kw, while the rear motor increases from 140 to 165 Kw, giving an increase of 13%. In terms of acceleration, this goes from a very quick 6.6 seconds, to an extremely quick 5.7 seconds. 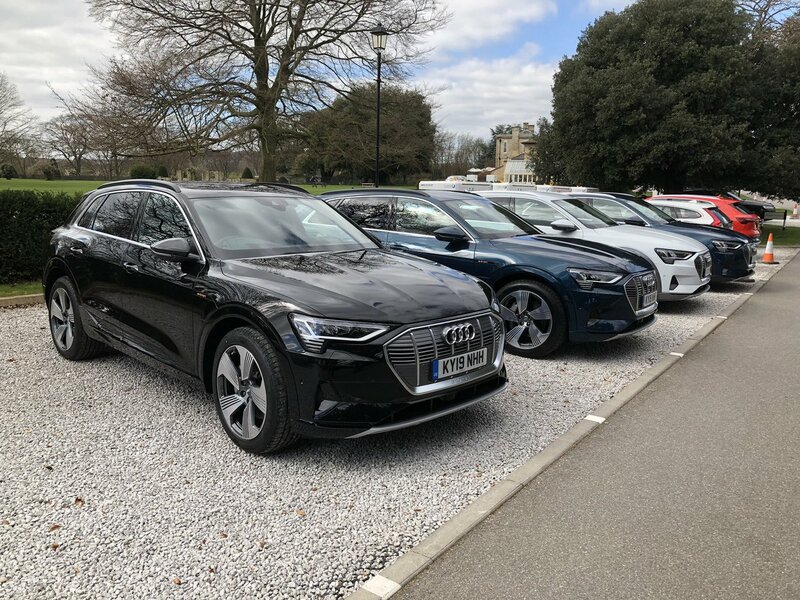 We drove the e-tron around Wetherby in Yorkshire, and even without using the Boost system, the instant power was enough to throw you back in the seat. As with all electric vehicles, the power is there immediately, no lag, or waiting for a bit of action, it really is instant. The design of the e-tron is very Audi, taking some styling cues from the recently launched Q8, a bit of Q5, and other popular Audi models. As we walked around it, while taking photographs, and had a really good look at it from every angle, it all works perfectly. The large front grille, with its chrome surround and vertical strips. The side view has some lovely lines, with some clever metal pressing. The rear end has the lights that run across the rear door. It does look good from every angle, and all in proportion. 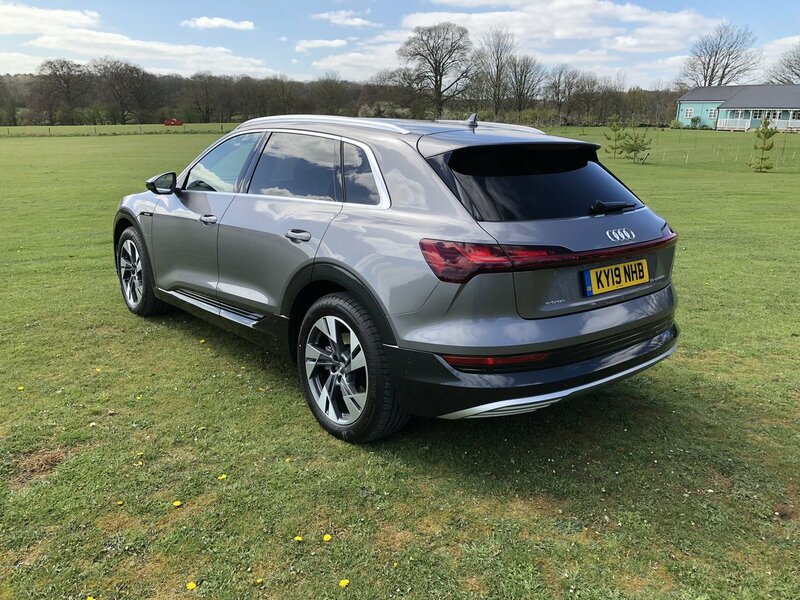 But it should look great, as Audi have had plenty of practice of designing and producing SUV’s for a number of years now, and it does look great. 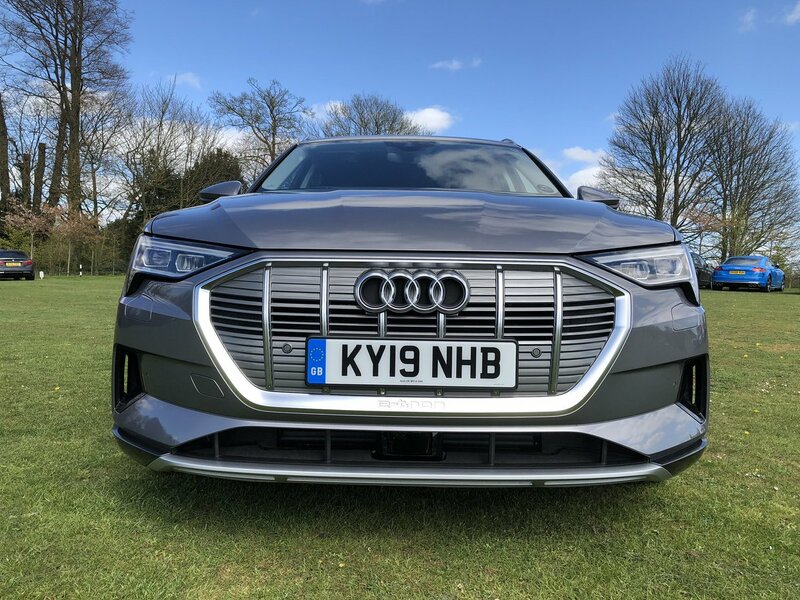 Audi have also been clever, and wise in making the e-tron look ‘normal’ and just because it is a pure EV, not tried to make it look ‘wacky’ or outrageous, it looks like an Audi, but happens to be Electric. The e-tron that measures 4,901mm, doesn’t have a lot of competitors: Tesla Model X – 5,036mm and the Jaguar i-PACE is 4,682mm. Like all electric vehicles, and stating the obvious, it does need to be charged, on a fairly regular basis. The e-tron has two charging ports, one on the drivers side is for AC and DC charging, and one on the passenger side is AC only. The small opening doors are on the front wings. It can be charged using domestic plugs, a wallbox or fast DC charging stations at up to 150Kw can recharge to 80% in as little as 30 minutes. My own experience of using home charging, is very slow, and using a wallbox, not much quicker. With a full charge, the e-tron has a range of up to 240 miles, which when I heard this figure sounded a bit disappointing, I was expecting more. When you compare this to the KIA e-Niro, this car, which is smaller, has around a 100 mile range benefit over the Audi. The interior is very modern, so luxurious, and just oozes quality. Materials used, fit and finish are superb. The only small criticism of the interior is the gear-shift handle, as Audi have moved away from the heavy, clunky and prestigious lever, to a cheaper, lightweight, what seemed plastic square lever, that just didn’t look or feel right, and certainly wasn’t ‘Audi-Haptics’. Out on the roads in Yorkshire, and on an admittedly short test route, due to time restrictions, it drove perfectly, no surprises (though one or two surprises for my passenger when I put my right foot down, and I can’t say exactly what words he used) the e-tron did everything right, a real pleasure to drive. It is quick, and like all electric cars, it is extremely quiet. Rear leg room is more than adequate, plenty of shoulder and head room. 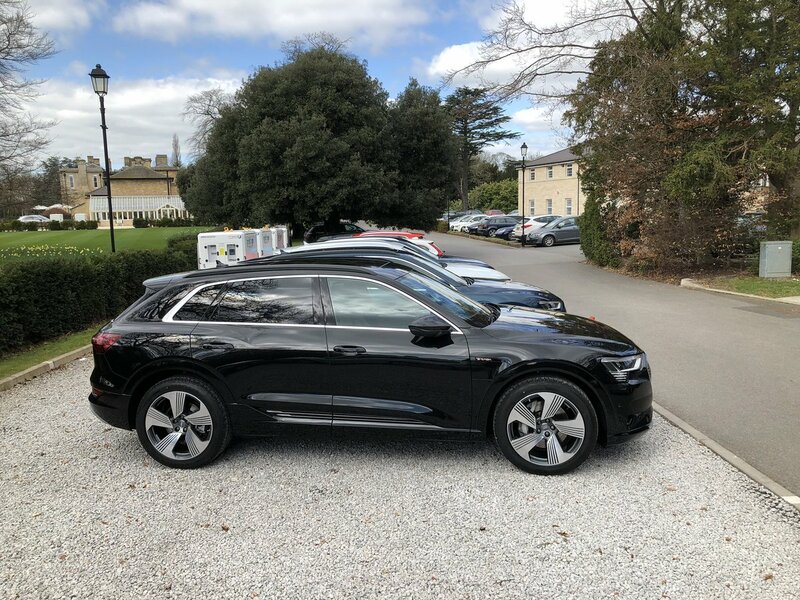 The boot area is 660-litres with the rear seats up, and this goes up to 1,725-litre with them folded down, compared to the Model X (5-seat) at 357-litre and 2,259, and the i-Pace at 505and 1163-litres. The interior of the e-tron is a very nice place to sit, either as the driver or passengers. The e-tron is full of goodies and high-tech standard equipment, although you could spend a small fortune on some very nice options. This very practical, full-electric all-wheel drive, with a spacious interior, is superb, so clever in every department, and a dream to drive. Prices start from £71,520 OTR (before the OLEV grant reduction) with residual values expected to be very high, as this will be a very popular and sought after used car for many years to come.